This project is a fantastic opportunity to get to know Matteo and Thomas, see how they work, talk to them personally and most importantly - spend two special days with them, with the possibility to ask questions what techniques they use and how they prepares theirs unique art. DETAILS OF SEMINAR PROVIDED BY MATTEO & THOMAS. First day – 6 JUNE 2019 Beginning : 1p.m. Introduction to the working methods of both artists, with reflections on the reasons of their technical choices, according to previous experiences (positive but above all negative). To follow, debate at 360 degrees, on the techniques addressed by both artists, during the realization of a typical work of them. From the choice of the reference, to the creation of the stencil, the choice of materials, up to the advice for aftercare. All will be supported by audio-video demonstration material. At the end, discussion pannel in which the artists will answer the questions of the participants. Second day – 7 JUNE 2019 Start at 11 am. 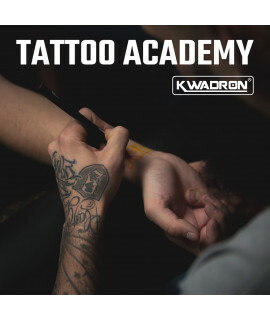 During this day, both artists will perform a tattoo simultaneously. It will be possible to approach (discreetly) the workstations, in order to assist closely and ask for explanations about the steps taken during the execution of their work. At the end of the seminar a personalized certificate of participation will be issued. The cost of the seminar is 1845,- EUR (vat included) For those who are interested, are kindly asked to confirm their willingness to participate. Then, You will then be informed how to book and pay. English Price and payment methods - the cost of participation is EUR 1500 +vat tax 23% per person(1845 Euro). This amount does not include food and accommodation. Payment for the seminar will be charged two weeks before seminar. Details will be sent to people who will be on the list of participants. There is no possibility of accompanying people at the seminar. MEALS: Self-catering - in the Hotel you can buy full board. For those interested, we will prepare a menu of meals available in the hotel's restaurant during a seminary lunch break. TRANSPORT: Transport to seminar is on your own The hotel offers the possibility of transport from and to the airport after prior individual arrangement.